Overlooking Savannahâs picturesque Forsyth Park in the Historic Landmark District, the Mills B. Lane House, c.1907 is a Georgian Revival jewel. 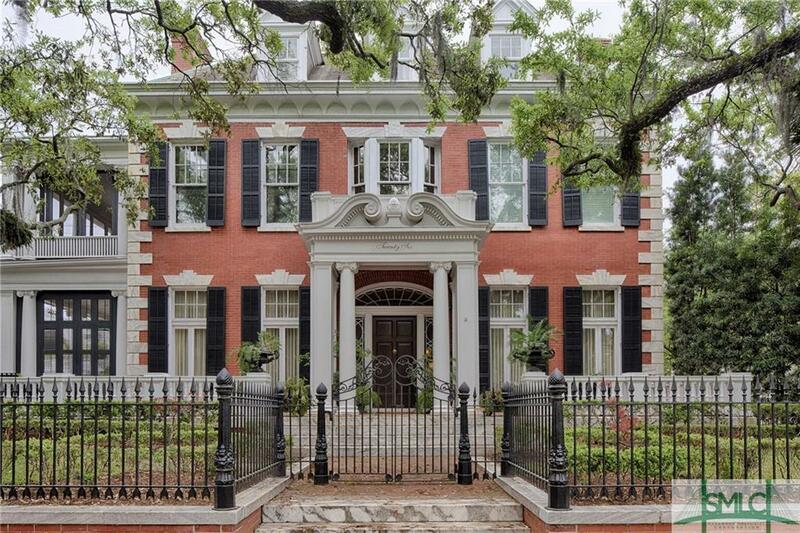 The iconic home is known for its Ionic columns, âSwanâs neckâ pediment, grand shuttered windows with splayed lintels, parquet floors, and period moldings with 29 handpainted murals adorning the grand entrance hall. Handsome pocket doors open to two formal parlors, a ballroom-size dining room, and an intimate library with built in bookshelves, all with French doors revealing the poolside garden veranda. The estate features a gourmet chefâs kitchen with butlerâs pantry and commercial grade luxury appliances, lower-floor wine and billiards rooms and spa, four third-floor bedroomsâone the luxurious master suiteâand a fourth-floor suite. An elevator adds to the modern convenience of this immaculate home. The terrace and in ground pool along with pool house afford a private oasis in the heart of Savannahâs celebrated downtown neighborhood.